“…the [UN] inspector general also noted that US reconstruction projects, particularly those devoted to ‘improved irrigation, roads, and agricultural assistance’ were probably leading to the explosion in opium cultivation. In Colombia, the US government proved it could eradicate coca and opium-poppy growing fields. One of the solutions was an herbicide called Roundup. You may have heard of it. But in Afghanistan, the US just didn’t remember that. It skipped their mind. Oops. Suddenly, the Afghanistan mission became one of good will. Mustn’t upset the farmers. In Colombia, upsetting the farmers was perfectly all right. When you can lessen a problem but choose not to, you want the problem to persist. It’s simple. And at that point, the problem becomes an opportunity—it always was. More opium poppy; therefore, more heroin. More trafficking, more profits. Since the US government has been consciously facilitating the growth of opium farming in Afghanistan, it stands to reason that government players have been taking their cut of the action. If the US government, which has been fighting a full-scale war in Afghanistan, wanted to destroy the opium-heroin business in that country, it had the ideal opportunity. The mission would have been far easier than waging “the war against drugs” in Mexico, where US military intervention has been limited. In Afghanistan, there were US troops on the ground. There were air attacks. What else would you need? Pentagon planners spend their lives working out multiple scenarios for possible wars in various regions of the planet. They take into account all aspects and contingencies. In planning for a war in Afghanistan, what to do about the opium-poppy growing fields would have been high on the list of options. So opium-poppy farmers were no “delicate problem” the US invading force encountered after entering the country. There were no surprises. Since the US invaded Afghanistan, the Army knowingly undertook operations that would definitely expand opium-poppy agriculture. 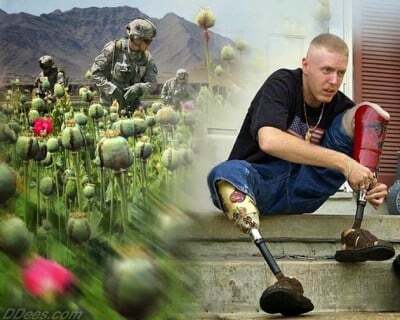 Of course, the CIA’s connections to the drug trade in Afghanistan go back a long way, so it’s no surprise that the US war in Afghanistan has facilitated and expanded opium-poppy production. The war against drugs? A towering joke. Jon Rappoport is the author of two explosive collections, The Matrix Revealed and Exit From the Matrix, Jon was a candidate for a US Congressional seat in the 29th District of California. Nominated for a Pulitzer Prize, he has worked as an investigative reporter for 30 years, writing articles on politics, medicine, and health for CBS Healthwatch, LA Weekly, Spin Magazine, Stern, and other newspapers and magazines in the US and Europe. Jon has delivered lectures and seminars on global politics, health, logic, and creative power to audiences around the world. You can sign up for his free emails at www.nomorefakenews.com andOutsideTheRealityMachine.wordpress.com.